Considering the striking individualty of Bulgarian compared with the other Slavic languages, some non-Bulgarian linguists use also the terms: east-southern Slavic dialects; Balkano-Slavic dialects; Macedonian dialects; Slavic dialects in Northern Greece, Albania, and Kosovo, etc. With such descriptions they indicate the dialects of the whole Bulgarian historical and geographic dialect territory. Although they avoid using explicitly the national designation, in fact, they acknowledge the individuality and unity of Bulgarian language. Bulgarian dialect language today because of changes of extra-linguistic character is found in and outside the state borders of Republic of Bulgaria in the three historical regions: Moesia, Thrace and Macedonia. It has a chracteristic individuality: in the ninth century, it is a classic Slavic language, and now it is a Balkan language, characterised by nouns with no cases but with rich articularisation, analytical formation of the degrees of comparison, doubling of the object, etc. ; in the verbs - replacing the infinitive with a "to" construct, formation of an analytical future tense with particles and so on. These grammatical features (with minor exceptions) are characteristic of all dialects and the specifics of the Bulgarian language is built on them as an individual and characteristic Slavo-Balkan language. This characteristic is confirmed by hundreds of foreign researchers. In the field of phonetics and vocabulary, however, differences between dialects are essential and the dialect classification is done on them. Bulgarian dialectology dates to the 1830s and the pioneering work of Neofit Rilski, Bolgarska gramatika, published 1835 in Kragujevac. Other notable researchers in this field include Marin Drinov, Konstantin Josef Jireček, Benyo Tsonev, Yordan Ivanov, Lyubomir Miletich, Aleksandar Teodorov-Balan, Stoyko Stoykov, Stefan Mladenov, Blagoy Shklifov. An important characteristic of Bulgarian dialectology is that the names of dialects and dialect groups are based exclusively on the geographic principle which helps to classify dialects objectively on the basis of linguistic traits, irrespective of the political conjuncture. This is in sharp contrast to the dialectologies of neighbouring countries which base their dialect classifications on subjective ethnic grouping, e.g., Serbian dialectology – "torlak", "shop", "macedonian (in ethnic sense)" dialects; Greek dialectology – "pomak" dialect, etc. As a rule, ethnic dialectology has resulted in invented nationalities turning dialectology into a weapon for political aspirations. Bulgarian language area is located in the Eastern part of the Balkan Peninsula. To the north, it borders Romanian language, of the Roman language family. The language border goes along Danube from the Timok Estuary to the town of Silistra, then it crosses Dobrudja and ends at the Black Sea coast. In the past, a numerous Bulgarian population lived in Romanian (Northern) Dobrudja but in 1941 according to an agreement between the Bulgarian and Romanian governments, these people were moved to the Bulgarian (Southern) Dobrudja in the place of re-settled Romanian population. Therefore, the northern border of Bulgarian language is clearly delineated as it separates two different languages: Bulgarian and Romanian. The eastern border is the Black Sea. The southern border of Bulgarian is not clearly defined. The Bulgarian population in the southern parts of Thrace and Macedonia lived for many centuries mixed with other ethnicities, primarily Greeks and Turks, speaking languages, very different from Bulgarian. So, instead of language mixing, these ethnicities remained clearly differentiated on the language basis and, indeed, language became the main ethnic characteristic. A large part of Bulgarians (Grecomans) spoke Greek in public and Bulgarian at home. Islamised Bulgarians (Pomaks) spoke a Bulgarian dialect mixed with Turkish words. And yet, a historical border to the south exists that separates Bulgarians from others. It is the old Roman road Via Ignatia that connects the Adriatic with the Black Sea. For a large part, it goes close to the Aegean coast . North of Via Ignatia Bulgarians predominate while south of it they are in the minority. A 1865 map of the Balkan Peninsula, showing the track of Via Ignatia . To the west, Bulgarian borders Serbian language. This border, however, is not clearly defined. Bulgarian and Serbian are very similar Slavic languages, and Bulgarians and Serbs have a lot in common in their languages and customs. Because of the specific historical circumstances on the lands around the Bulgarian-Serbian border, the population there lived for many centuries in a single economical, political, and cultural community. Thus, on a dialect basis, the languages are not easily distinguished. Until 15th century, these lands were alternately under Bulgarian and Serbian rule, and then for 5 centuries they were ruled by the Ottomans. The state border was established only in 1878; until then the Serb-Ottoman border went much further to the west . The border to the south is defined by Bistritsa River from its sources to its estuary, then by Hortach, Vavro, Kolomenta, Kakavo, and Erisovo. Bulgarian language is prevalent to the north of the above rivers ... To the north, starting from the beginning of the mountain range separating Prizren and Shkodra sandzaks, the border between Bulgarian and Serbian tribes consists by the high chains of Shar that reach as far as Kachanik where they connect with the so-called Skopian Montenegro. From Kachanik to Morava River, the border goes along the above-mentioned Skopian Montenegro. The border between Bulgarians and Serbs living in Kosovo plain is Morava River. From Morava River as far as the Danube the vernacular is identical to that of Macedonian and Thracian Bulgarians ... (, pp. 43-44). The studies of Verković which he did for 30 years, are fully confirmed by other Serbian scientists, such as Milovan Vidaković (1833), Dr. Jovan Subotić (1845), Jovan Gavrilović (1863), Tuminski (1868), А. Haǆić (1870), Vasa Pelagić (1879) and others. The border between Bulgarian and Serbo-Croatian languages and peoples is the line that begins on the right bank of Sava River, goes to the south along the watershed of Kolubara and Morava, then along the watershed of Serbian Morava and Ibar to Skadar and the Adriatic Sea. Bulgarian south-western language borderline, starting at the mountain ranges of Gorusha and Gramos and from Belitsa River to the south turns from the village of Slimitsa to the east and further to the north, to the Bulgarian village Lobanitsa and to the Bulgarian-Albanian town Biglishta goes to the north-west ... From the village Podbuche it goes to the south shore of Ohrid Lake, to the Bulgarian monastery "St. Naum". At Struga the borderline goes to the west of Drin. Further to the north-west of the crest of Golo Brdo at the village Torbochani crosses to the other side of Drin River ... along the Drin ... From here, at Kenok Hill, the border turns to the east to the Bulgarian Muslim village Zhernonitsa and further to the Mavrovi Inns ... to Rudoka Mountain, to the Vratsa Pass and to the villages of Prizrenska Gora, situated between Shar Mountain, Rudoka Mountain and Koritnik ... From Gora to the north-east through the Shar Mountain, from its peak Lyubotran and then to the east, north of the Bulgarian village Rogachevo, goes to Dervent in Polog near Vardar and further to the north-east to Skopjan Montenegro (pp. 1-3). Compared, the three quoted authors agree completely. This shows the precision of their research, although carried out in different years and circumstances. Indeed, in the borders so delineated, there are foreign populations: Albanians, Turks, Greek, as well as Turkified, Hellenised, or Serbianized Bulgarians but as long as there is a language with the traits characteristic for Bulgarian language, it is strictly Bulgarian, different from all other languages. However, the various geographic, historical, political, and economic factors exerted a powerful influence to generate a great variety of dialects. A number of traits cross in these dialects which are not present in all of them but occur in such combinations that give an individual aspect of each dialect. The dialects are similar or dissimilar to each other but in a way that creates a complex branched chain between them. Thus, Bulgarian dialects are doubly connected: through common traits that make a single language regardless of minor variations, and through local traits characterising dialect groups that also unite dialects into a single language but through a chain-like connection. The strength of this link is felt especially in the similarity of dialects which are distant in geographical sense (e.g., Smolyan dialect in the Rhodopes and the Debar (Miyak-Rekantsi) dialect as far as the Albanian mountains in Macedonia, or the Shop dialect along Iskar and the Moesian dialects towards Danube and the Black Sea. The dialects along the western Bulgarian border, so-called 'transitional dialects', became an object of the Greater Bulgarian and Greater Serbian jingoism. Bulgarian and Serbian politicians tried through dialectology to prove that the dialects in the border area are pure Bulgarian or pure Serbian. Bulgarian linguists drew the border of Bulgarian language far to the west — from the Timok Estuary through Zaecar, Bolevac, Stalac, Pristina to Prizren. 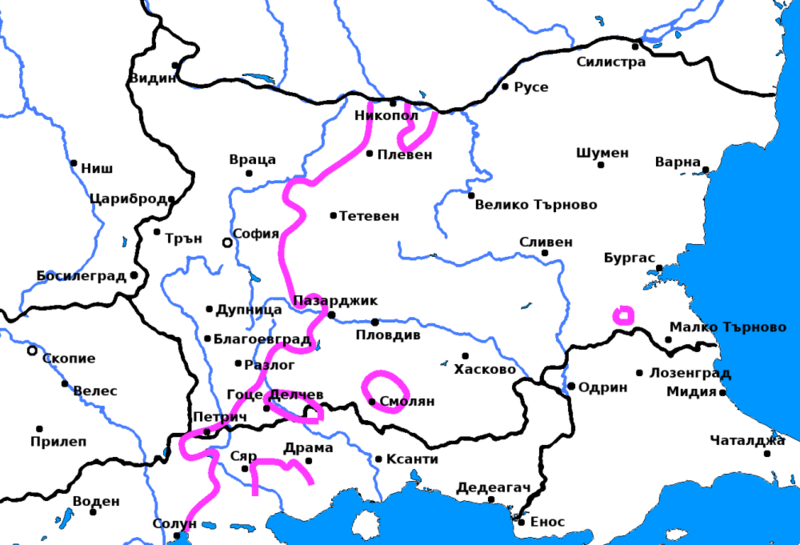 Serbian linguists placed the eastern border of Serbian language at Iskar River or even at the Yat border . In fact, not only along the Bulgarian western border but everywhere, especially among Slavs, in the border areas between close languages there are always transitional dialects and the change from one language to another is very gradual. The transitional dialects can be explained with the instability of political borders between the peoples during their national formation. The population in the border area usually had been ruled alternately by one or another Middle Age state or Empire, and had lived together with close economical, cultural, and political ties. Such transition is seen for Czech and Polish dialects, Polish and Byelo-Russian, Russian and Ukrainian, etc. Interactive Bulgarian dialect map showing the individual dialects. Bulgarian language developed in historical circumstances that contributed to its dialect segmentation and crossover. Therefore, today it is among the the most dialectically segmented Slavic languages. Modern Bulgarian dialects carry remnants from old tribal divisions of the Bulgarian ethnos during its historical development from the First Bulgarian State until the end of the Ottoman rule. Classification of Bulgarian dialects in dialect groups is difficult and arbitrary because the ties between local dialects cross in a counter-intuitive way. Indeed, Bulgarian dialectology recognises a classification based on geographical regions but it is only tentative. According to this classification, there are so-called territorial dialects: 1) Eastern dialects, subdivided in Moesian, Balkan, and Rup dialects, each with its subdialects; 2) Western dialects, subdivided in North-western, South-western, and transitional. These groups are not unique; each of them crosses with the others in various ways, so it would be more instructive to describe dialect similarities and differences on the basis of some ten major traits and several language forms of such nature as to give an impression of a dialect, imparting to it an individual flavour. The oldest and most widely accepted Bulgarian dialect isogloss is the Yat border. It was established more than 150 years ago and has received strong support throughout. According to the Yat classification (the mutation of the Old Bulgarian vowel ѣ (Yat)), Bulgarian dialects are divided in 2 large groups: Yakavian (Eastern) and Ekavian (Western). Ekavian dialects pronounce ѣ solely as /ɛ/ (/bɛl/, /bɛli/) while Yakavian pronounce it /ʲa/ or /e/ (/bʲal/, /beli/) or solely /ʲa/ (/bʲal/, /bʲali/). In the Middle Ages, Yakavism was widespread in the whole Bulgarian language area, reaching to the extreme south-west. This is evidenced by the 16. century Bulgarian-Greek dictionary, written in the Kostur dialect (Bogatsko), e.g., хляб (bread), желязо (iron), вядро (bucket), коляно (knee), простряно (spread), невяста (wife), ряка (river), вятер (wind), сячиво (tool), etc. Western dialects (mutational Yat) which instead of Yat use only e /ɛ/ (/ɡɔlˈɛm/, /ɡɔlˈɛmi/, /ˡlɛtɔ/, /ˡlɛtɛn/, /ˈmlɛkɔ/, /mlɛkˈar/). Such were the dialects on the Danubian Plain west of the Yat border, plains to the north and south of the Balkan Mountain: Botevgrad, Sofia, Ihtiman, Samokov, Radomir, Dupnitsa, Kyustendil, the Western Borderlands, dialects in Central and Western Macedonia and transitional dialects. Northeastern dialects (semi-mutational Yat) which instead of Yat use я /ʲa/ or e depending on accent and on the next syllable (/ɡɔlˈʲam/, /ɡɔlˈemi/, /ˡlʲatɔ/, /ˡleten/, /ˈmlʲakɔ/, /mlekˈar/). Such were the dialects on the Danubian Plain east of the Yat border, all Balkan and Middle Mountains Region and to the south in the Thracian Plain to the slopes of the Rhodopes. Southeastern dialects (non-mutational Yat) which instead of Yat use either я /ʲa/ (/ɡɔlˈʲam/, /ɡɔlˈʲami/, /ˡlʲatɔ/, /ˡlʲaten/) or e /ʲe/(/ɡɔlˈʲem/, /ɡɔlˈʲemi/, /ˡlʲetɔ/, /ˡlʲeten/). 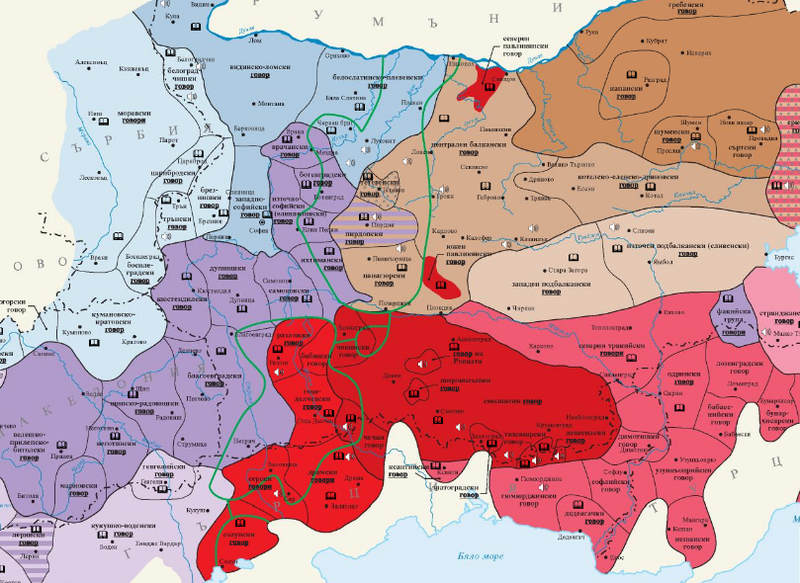 Such were the dialects in the southern part of Burgas, Elhovo, Topolovgrad, Harmanli, Dimitrovgrad, Haskovo, south of Plovdiv, Asenovgrad, Peshtera, Smolyan, Devin, Chepino, etc. The Yakavian-Ekavian classification of Bulgarian dialects is clear-cut but it has serious flaws. First of all, there are no other isoglosses that coincide with the Yat border. Usually, at both sides of the Yat border there are completely identical dialects which differ only by the Yat pronunciation. Furthermore, a single linguistic trait, whether phonetic, morphological, or lexical, is not sufficient to characterize a dialect or dialect group. For this reason the Yat division of Bulgarian dialects is actual and important at present. One must have in mind that the Yat pronunciation, as a very frequent trait, is very characteristic for Bulgarian dialects — it can readily identify colonists from individual regions of the Bulgarian linguistic territory. Furthermore, there is no other linguistic trait that groups so clearly and regularly the Bulgarian dialects. This is evident by the attempts of Prof. Tsonev to classify Bulgarian dialects by other traits like the Big Yus (Big Nasal) substitutes, diphtong /ʃt/-/ʒd/ mutations, Yer substitutes, accent, etc. ъ-dialects (ръкà /rɘk'a/, зъп /ˡzɤp/, зъби /zɘbˈi/). These are the majority of Bulgarian dialects and the standard Bulgarian. These dialects are located mostly in the North-Eastern and North-Western Bulgaria, the eastern part of South-Eastern Bulgaria, large part of Macedonia (Drama, Ser, Kukush, Doiran, Gevgelia, northern Kostur, Dolna Prespa, southeastern Lerin, Ohrid, Resen, Struga, Gostivar, north of Debar), Gora , Thrace (Aegean Thrace, European part of Turkey), and small areas in Asia Minor. у-dialects (рука /rˈuka/, зуб /ˡzub/, зубе /zˈubɛ/). These dialects are the transitional dialects located around the Bulgarian-Serbian border (Belogradchik, Tsaribrod, Tran, Breznik, Bosilegrad) and northern Macedonia (north of Kumanovo, Kratovo, Skopie). о, ô-dialects (рòка /rˈɔka/, зоп /ˡzɔp/; рồка /rˈɐka/, зôп /ˡzɐp/). These dialects have isolated character and are found in the Central and Eastern Rhodopes and around Debar in Macedonia (ô-dialects also in Western Rhodopes). ê-dialects (рềка /rˈæka/, зêп /ˡzæp/). These are found only in Teteven Region, two villages in eastern Bulgaria (Kozichino (Erkech), Pomorie Municipality and Gulitsa, Varna Municipality), three villages in the southwestern corner of Vardar Macedonia around Struga (Radozhda, Vevchani and Mali Vlay), and the village Lin in Albania. The above dialects have lost the old nasalism of ѫ. The next 3 groups have preserved the nasalism in a slightly modified form. Modifications include increased articulation of the nasal vowel to the extent of separating the nasalism in a consonant − н /ŋ/ in front of voiceless consonants or м /ɱ/ in front of voiced consonants − and dialect-specific substitution of the nasal vowel. This trait defines the nasal dialects as very ancient. ън/ъм-dialects (рънка /rɘŋkˈa/, зъмб /ˡzɤɱb/) – Solun dialect, Kostur dialect, and most of Dolna Prespa dialect. ан/ам-dialects (ранка /rɑŋkˈa/, замб /ˡzɑɱb/) – extinct trait of Korcha dialect. ôн/ôм-dialects (рôнка /rɐŋkˈa/, зôмб /ˡzɐɱb/) – existed in the Kostenariya and Nestram in the southernmost Kostur dialect area. Probably, ôн/ôм-dialects are the oldest because in them ѫ is closest to its original pronunciation. шт/жд-dialects (нош(т) /nɔʃ(t)/, леща /leʃta/, среща /sreʃta/; прежда /preʒda/, вежди /veʒdi/, межда /meʒda/) take the major part of the Bulgarian dialect area being exclusive in all Eastern and Northwestern Bulgaria, prevalent in Samokov, Sofia, Ihtiman, Ohrid, Struga, pocket close to Lerin (Banitsa, Pətele, Ekshi Su, Zeleniche, Prekopana), Dolna Prespa, Solun , Drama, Ser, Dupnitsa, Kyustendil, Petrich and mixed with other *tj, *dj mutations in the rest of the dialect area. ч/дж-dialects (ноч /nɔtʃ/, лeча /lɛtʃa/, среча /sretʃa/; преджа /prɛdʒa/, веджи /vɛdʒi/, меджа /medʒa/) in which the palatal affricates ћ /cç/ and ђ /ɟj/ that were borrowed from the Serbian language since the 16-17th century were hardened (de-palatinized) to become ч /tʃ/ and дж /dʒ/. These are the transitional dialects around the Bulgarian-Serbian border in the regions of Belogradchik, Tsaribrod, Tran, Breznik, Bosilegrad , and some regions in Eastern Serbia (Pirot, Surdulica), Kosovo (Gora), and Northern Macedonia (north of Skopje and Kumanovo). к/г(кь/гь)-dialects (нокь /nɔc/, лекя /leca/, срекя /sreca/; прегя /preɟа/, вегьи /veɟi/, мегя /meɟа/) are spoken to the west and north-west of Kyustendil (Kyustendil Kraishte and Kamenitsa), northern Macedonia (Gorni Polog, Skopska Crna Gora, Kumanovo, Ovče Pole, Kratovo, Kriva Palanka), Tetovo, Veles, Prilep, Mariovo, Bitola and north of it; and partly (mixed with other шт/жд mutations) in the regions of Debar, Prespa, Kastoria (Kostur) (very rare), Doyran, Florina (Lerin), Kilkis (Kukush), Edessa (Voden), Pianec. The plosive consonants /c/ and /ɟ/ are pronounced usually without frication with different degree of plosion (dorsal to frontal) and palatization. A variation of this mutation, шт → йкь(jкь) /ʲc/ and/or жд → йгь(jгь) /ʲɟ/, occurs in some villages around Kukush, Voden, and Lerin. The area of mutation of the future tense forming particle (ще /ʃte/ → ке /kɛ/, кье /ce/) is much wider and includes also southern Sofia region, Ihtiman, Samokov, Pazardzhik, and some Eastern Rup dialects (Thrace and Strandzha dialects, e.g., Elhovo, Svilengrad, etc.). шч/ждж-dialects (ношч /nɔʃtʃ/, лешча /leʃtʃa/, срешча /sreʃtʃa/; прежджа /preʒdʒа/, вежджи /veʒdʒi/, межджа /meʒdʒа/) are found in a relatively pure state in Korcha, Kostur, Doyran, and Ohrid town; mixed with кь/гь and/or шт/жд mutations in Maleševo, south of Bitola, Debar, Struga, Dolna Prespa, Lerin; mixed with ч/дж mutations in Samokov (Shishmanovo) and Breznik. Variants of the жд → ждж mutation occur in Kostur (жд → ж /ʒ/) and Doyran (жд → йдж /ʲdʒ/). шкь/жгь-dialects (ношкь /nɔʃc/, лешкя /leʃca/, срешкя /sreʃca/; прежгя /preʒɟа/, вежгьи /veʒɟi/, межгьа /meʒɟа/) are limited to very small area south of Bitola (also variant шьк /ʃʲk/) and Eastern Rup around Strandzha (variant жьгь /ʒʲɟ/ as in вежьгьи /veʒʲɟi/). As repeatedly mentioned, *tj, *dj reflexes are an important phonological trait, characteristic for each individual Slavic language, and used for language differentiation. Bulgarian language is characterized with the шт(щ)/жд mutation on which the Standard Bulgarian is based. The presence of numerous *tj, *dj variants on the Bulgarian linguistic territory indicates outside linguistic influences and/or spontaneous modifications due to linguistic isolation of peripheral areas. Alternatively, this variability may be (and has been) explained with coexistence of fundamentally different dialect systems. This latter case would be indicated by an approximately simultaneous separation of two or more reflexes from the primitive Proto-Slavic *tj, *dj. This issue became actual and received an added importance, with political overtones, in connection with the Bulgarian vs. Macedonian controversy. Historically, as in other border regions, this started as Bulgarian vs. Serbian controversy. Stojan Novaković, Serbian politician and diplomat, charged by the Serbian government with the mission to organize the assimilation campaign in Macedonia in accordance with the Serbian national (Garašanin) doctrine, propagated the idea that Slavs in Macedonia were Serbs because they spoke a dialect of Serbian language with the typical Serbian ћ,ђ reflex of Proto-Slavic *tj, *dj. Aleksandar Belić, a Serbian linguist, was more careful in making some distinction between Serbian affricates ћ,ђ and Macedonian plosives кь,гь; however, he considered the latter as a very close variant which is evident by the symbols that he used for those − ћК and ђГ. According to Belić, Macedonian dialects were divided into Southern (Solun, Kostur, Korcha to Bitola, Resen, Ohrid and Debar) and Northern ("true Macedonian dialect", Tetovo and Štip). In the Southern dialects *tj reflects in шт(шч), and *dj reflects in жд(ждж), while in the Northern the reflexes are ћ(ћК) and ђ(ђГ) . The most detailed and comprehensive study of the *tj, *dj reflexes in Macedonia and Albania was carried out by the Russian linguist Afanasy Selishchev  . He studied this phonetic trait in all aspects: not only the territorial distribution of dialect variants but also occurrence in different words, in different grammatical positions with a clear idea of all acustic and physiological specifics in relation to the neighboring Slav languages using data not only from written documents but also from toponymy. Selishchev stressed the fact that unlike the Serbian ћ and ђ, the Macedonian кь and гь are pronounced without frication. A fricative element was found very rarely to the north of Tetovo but even there, кь and гь were not identical to the Serbian affricates. Selishchev also noted the reduced palatization of кь and гь, which varies in different Bulgarian dialects from Macedonia. On the basis of his study of the territorial distribution of шт/жд, шч/ждж, and кь/гь, Selishchev found that the basic reflex of the Proto-Slavic *tj, *dj in dialects from Macedonia is шт/жд or its more ancient stage шч/ждж. Using a huge amount of dialectological material, he found that this pronunciation was fixed on a large part of the territory of Macedonia: Debar, Struga, Ohrid, Resen, Kostur, Lerin, Solun, Kukush, Doyran, Maleševo. The шч/ждж is archaic and gives way to шт/жд. For this conclusion, Selishchev used the studies of V. Oblak and B. Tsonev who noted that in some dialects the old people spoke шч/ждж while the young knew only шт/жд. It was notable that the archaic шч was more resistant to the newer шт than ждж to жд. Thus, in some Debar, Resen and Kostur dialects the archaic шч was found along with жд. Palatal кь, гь in a limited number of words and forms (e.g., кукя, кье, векье) are found also far to the east of Macedonia. Thus, the particle кье is found in many Eastern Bulgarian dialects. Nevertheless, through deeper analysis, Selishchev came to the conclusion that кь, гь are not innate to dialects in Macedonia but were calqued from the imported Serbian analogs together with the whole word. For example, the word кукя (house) is found throughout Macedonia. The process of borrowing is confirmed by the root vowel: here in the place of the dorsal nasal vowel one finds the vowel у /ʊ/ (compare bg:къща /kɤʃta/ with sr:кућа /kʊcça/). Even in Northern Macedonia, in Lešok, Selishchev heard both кукя and къща . Toponymy provided very valuable data for study of кь and гь. Selishchev showed with toponyms that in the dialects of central Macedonia шт, жд are more ancient than кь and гь. For example, while in the vernacular from Prilep region the word for trousers is гакьи, diphthong шт is still preserved in the names of villages around Prilep − Кривогаштани /krivɔgaʃtani/ ("Crook-trousers") . Later, he used toponyms to solve very difficult and baffling problems from the history of Macedonian dialects. Supported by many sources, Selishchev showed that the process of replacement of шч (шт) - ждж (жд) by кь, гь had been long and, by WWII, yet unfinished in many parts of Macedonia. Selishchev showed convincingly that this process goes from north to south. In the southeastern and southwestern corners, a very limited number of words were spoken with кь, гь. The suffix -kaki interpreted as a reflex of the Proto-Slavic *ko,tja is a composition of heterogeneous elements that are never found in Macedonia. In dialects from Macedonia occur either къшта (къшча) or кукя. There are no examples of кушта (кушча) or къкя (какя). If such were found, they would contain both Bulgarian and Serbian reflexes of the Big Yus and *tj. The toponym Gardikaki, for example, is unique in this respect. Selishchev pointed out that these toponyms can end in -i but also without it. In Epirus and Albania they less often end in -u. These comparisons showed that the second element of the toponym was not related to the Proto-Slavic *ko,tja. The thorough research was successfully completed after taking into account the geologic and soil science publications on Albania and North Greece. From Albanian language, it was seen that the suffix -kuкь can be interpreted as "red"; it is often found on territory with Albanian settlements and specifically in places where the soil has reddish hue. In the region of Upper Shqumba the mountain peaks in Lurje are called Gurikuкь which means "red stone". North of Argirocastro one finds Hundokuкь or Hundёkuкь which means "red nose". In his book, Selishchev described many more examples . This comprehensive analysis of dialects and toponymic data in Macedonia and Albania showed convincingly that кь, гь in place of the Proto-Slavic *tj, *dj is a late phenomenon arising under the influence of the Serbian phonetic system introduced (sometimes sporadically) by the Serbian administration, rulers, settlers, and teachers . This analysis has wider significance beyond the narrow frame of classification of Slavic dialects in Macedonia and Albania. It bears direct relationship to the origin of Old Church Slavonic (Old Bulgarian) language. Before the publication of this analysis, in the Slavistic literature was current the hypothesis of N.S. Trubetskoy, N.N. Durnova and some other Slavists, according to which кь, гь arose directly from the Proto-Slavic *tj, *dj and were present in the language of Cyril and Methodius. The studies of Selishchev disproved this hypothesis . Most linguists accepted Selishchev's conclusions , including most Bulgarian linguists  . Some of the latter (Blagoj Shklifov, V. Georgiev) disagreed on the issue of whether кь, гь are internal or borrowed and in 1981-82 hypothesized that these reflexes arose as a result of specific processes, innate for the dialects in Macedonia  . However, this new point of view was not supported by argumentation . Some leading linguists from Republic of Macedonia (e.g., Acad. Božidar Vidoeski) appraised the study of Selishchev and used his classification and data in their works ; others implicitly acknowledged Selishchev's conclusions. For example, Blaže Koneski in his A Grammar of the Macedonian Literary Language (book 1, 1952) in which he stipulated the norms of the Macedonian Standard, listed the кь, гь reflex only as a second, supporting distinctive trait in Macedonian language after the ъ → o reflex; the latter is, indeed, a very early trait. The Dutch Slavist Nicolaas van Wijk proposed a classification of Bulgarian dialects by the reflex of OBg. ъ /*ɘ/ in o /ɔ/, that is, by the isogloss ъ − о: сън, дъш → сон, дош instead of OBg. сънъ, дъждь . This reflex is known for its antiquity and since the time of Old Bulgarian divided the Bulgarian language area in two main dialect groups — Eastern and Western. However, the isogloss о—ъ is not very clearly distinguished and exhibits a great variability. Thus, о instead of OBg. ъ is found in the Western dialects and Pirdop dialect but in some dialects it is only in prepositions and prefixes (воф, воздàхна, сос, собỳе), in others − in prefixes and suffixes (воф, сос, пèток, песòк), and in third − in all closed syllables (вос, сос, пèток, бòчва, дош). Only in some Bulgarian dialects in Macedonia (Malashevo, Veles, Prilep-Mariovo, Debar, Kostur, Doyran, Kukush, Voden) vowel o completely substitutes ъ. Complete reflex ъ → о is found in some Rup dialects but there it is a result of a specific late process replacing a secondary Yer when two Yers/Nasals (Big or Small) occur in the same word: дош from дъждь (Big and Small Yers), мòгла from мьглѫ (Small Yer and Big Nasal), зоп from зѫбъ (Big Nasal and Big Yer), кльòтва from клѧтвѫ (Small and Big Nasals). In the Moesian dialects of Northern Bulgaria there is a reflex (vocalisation) of OBg. ъ in о in the article form for masculine (гърбò, нусò) and in the suffix -ък (добѝтọк, пèтọк). Therefore, this trait does not allow for a clear-cut classification of Bulgarian dialects . Dialects with hard and soft reflexes comprising North-Eastern, South-Western, and the Eastern half of the North-Western dialects:ь > ъ (а) and е. This classification is also not very clear-cut and does not divide the Bulgarian dialect area in approximately equal parts. The suffix for plural in polysyllable masculine nouns that end in a consonant. In the North-Western Bulgaria (except part of Moesian dialects), this suffix is -и /ɪ/, in Western and South-Eastern Bulgaria it is -е /ɛ/: пръстени, ръкàви, гълъби — пръстене, ръкàве, гълъбе. The suffix for first person plural present tense for first and second conjugation verbs. In North-Eastern Bulgaria it is -м /m/, in Western and South-Eastern Bulgaria it is -ме /mɛ/: берèм, четèм, вървѝм — берèме, четèме, вървѝме. The words: аз/я, недей/немòй, крак/ногà, рѝза/кошỳля, стан/разбòй, горèщ/жèжък, къс/крап, etc. The first word of these pairs occurs in North-Eastern Bulgaria, the second — in Western and South-Eastern Bulgaria. Morphonological isoglosses in the accent of disyllabic neutral singular nouns and in the form for the imperative mood second person singular in the verbs of first and second conjugation. In North-Eastern Bulgaria the accent is on the suffix, in Western and South-Eastern Bulgaria — on the root: месò, кроснò — мèсо, крòсно; берѝ, носѝ, метѝ — бèри, нòси, мèти. Interestingly, the band of morphological and lexical isoglosses goes along the Yat borders: both the primary, accepted one (Vit estuary to Vardar delta) and the secondary, apparent one (Pazardzhik to Burgas). Thus, they define a central (middle) region comprising North-Eastern and Central Bulgaria, and a lateral (peripheral) region comprising North-Western, South-Western, and South-Eastern Bulgaria which envelops the central region of the Bulgarian dialect continuum. 1.Стойков (Stoykov), Стойко (2002)  (in Bulgarian). Българска диалектология (Bulgarian dialectology). София: Акад. изд. "Проф. Марин Дринов". ISBN 9544308466. OCLC 53429452. 3. Mazon, Andre. Contes Slaves de la Macédoine Sud-Occidentale: Etude linguistique; textes et traduction; Notes de Folklore, Paris 1923, p. 4. 4. Селищев, Афанасий. Избранные труды, Москва 1968. 5. Die Slaven in Griechenland von Max Vasmer. Verlag der Akademie der Wissenschaften, Berlin 1941. Kap. VI: Allgemeines und sprachliche Stellung der Slaven Griechenlands. 6. K. Sandfeld, Balkanfilologien (København, 1926, MCMXXVI). 7. Konstantin Josef Jireček, Die Balkanvölker und ihre kulturellen und politischen Bestrebungen, Urania, II, Jg. 13, 27. März 1909, p. 195. 8. Stefan Verković, Описание быта македонских болгар; Топографическо-этнографический очерк Македонии (Description of the life of Macedonian Bulgarians. Topographic and ethnographic essay of Macedonia), St. Petersburg, 1889. 9. Шклифов, Благой. Проблеми на българската диалектна и историческа фонетика с оглед на македонските говори (Problems of the Bulgarian dialect and historic phonetics with respect to the Macedonian dialects), София 1995, с. 14. 10. Шклифов, Благой. Речник на костурския говор (Dictionary of Kostur dialect), Българска диалектология, София 1977, с. кн. VІІІ, с. 201-205. 11. Mladenov, Stefan. Geschichte der bulgarischen Sprache, Berlin, Leipzig, 1929, § 207-209. 12. Цонев, Б. Граници на българската реч и народност (Borders of Bulgarian language and ethnicity). In: История на българския език (History of Bulgarian language). Vol. 1. Sofia, 1940, pp. 272-301. 13. Младенов, Ст. Граници на българската реч и държава в миналото и днес (Borders of Bulgarian language and state in the past and today). Родна реч, 1927, Issue 1, 16-23. 14. Младенов, Ст. Понятието „български език” и границите на българския език. Брой и разпространение на българите (The term "Bulgarian language" and the borders of Bulgarian language. Number and distribution of Bulgarians). In: Младенов, Ст. История на българския език (History of Bulgarian language). Sofia, 1979, 21-22. 15. Селищев, А.М., Болгарский язык (Bulgarian language). In: Селищев. А. М. Приноси в българската диалектология и етнография (Contributions in Bulgarian dialectology and ethnography). Sofia, 1986. 16. Otto Kronsteiner (Salzburg University), The collapse of Yugoslavia and the future prospects of the Macedonian literary language (Der Zerfall Jugoslawiens und die Zukunft der makedonischen Literatursprache). Der slawischen Sprachen, Wien, Band 29, 1992, S. 143-171. 17. Henninger, T. (Bedales School, Petersfield, UK). 1994. Bulgarian and Macedonian. In: The Encyclopedia of Language and Linguistics, 1: 429-430, ISBN 0080359434; Henninger, T. Slavic Languages 7: 3964-3966. 18. Prof. James F. Clarke. 1988. Macedonia from S. S. Cyril and Methodius to Horace Lunt and Blazhe Koneski: Language and Nationality. In: The Pen and the Sword: Studies in Bulgarian History, edited by Dennis P. Hupchick, Boulder: East European Monographs ; New York: Distributed by Columbia University Press. ISBN 0880331496. 19. Keith Brown. 2003. The Past in Question: Modern Macedonia and the Uncertainties of a Nation, Princeton University Press, p.2. 20. Vladimir Sis, Czech Balkanologist. 1918. Mazedonien. Zuerich. Art. Institut Orell Füsli. p. 74. 21. James Hastings. 2003. Encyclopedia of Religion and Ethics, Part 4, Kessinger Publishing, LLC ISBN 0766136884, page 79. 22. Robert D. Kaplan. Balkan Ghosts, ISBN 0679749810, p.60. 23. Hugh Poulton. 2000. Who Are the Macedonians? ISBN 0253213592. 25. Troebst, Die bulgarisch-jugoslawische Kontroverse um Macedonian 1967-1982, Muenchen, 1983. 26. Stefan Troebst, 'Makedonische Antworten auf die "Makedonische Frage", 1944-1992: Nationalismus, Republiksgrundung, 'nation-building', Sudosteuropa, Vol. 41, 1992. 27. James Pettifer, The new Macedonian question. International Affairs, Vol. 68. No.3, 1992. 28. F. A. K. Yasamee. Nationality in the Balkans: The Case of the Macedonians. In: Balkans: A Mirror of the New World Order, Istanbul: EREN, 1995; pp. 121-132. 30. Стойков, Ст., Основното диалектно деление на български език (Major dialect boundaries of Bulgarian language). In: Славянска филология (Slavic linguistics). Vol. 3. Sofia, 1963, 105-120. 31. Бернштейн, С.Б., Е.В. Чешко. Классификация юго-восточных говоров Болгарии (Classification of southeastern Bulgarian dialects). Изв. АН СССР. Сер. лит. и ез., 1963, вып. 4, 289-299. 32. Попова, Т. В. К вопросу о типологической характеристика болгарских диалектов (On the typological characteristics of Bulgarian dialects). Вопросы языкознания, 1961, No. 5, 78-86. 33. Бернштейн, С. Б. К вопросу о членении болгарских диалектов (On the classification of Bulgarian dialects). Вопросы языкознания, 1983, No. 4, 10-18. 34. Кочев, Ив. За основните проблеми на българската диалектология (On the principal problems of Bulgarian dialectology). Бълг. ез., 1984, No. 2, 97-109. 35. Бояджиев, Т. Диалектите на българския език (Dialects of Bulgarian). In: Българският език — език на 13-вековна държава (Bulgarian as a language of a thirteen century state). Sofia, 1981, 52-70. 36. Бояджиев,Т. За единството на българските диалекти (On the unity of Bulgarian dialects. In: Българистични изследвания. Първи българо-скандинавски симпозиум (Bulgaristic studies. First Bulgarian-Scandinavian Symposium. Sofia, 1981, 20-28. 37. Бояджиев, Т. Принципи и методи за класификация на българските говори (Principles and methods for classification of Bulgarian dialects). In: Исторически извори на българския език (Historical sources of Bulgarian language). Доклади (Reports). Vol. I. Сравнително езикознание. Диалектология. Превод (Comparative linguistic, dialectology, translation), Sofia, 1983, 205-215. 38. Бояджиев, Т. Българските диалекти и тяхната класификация (Bulgarian dialects and their classification). In: Българските народни говори. Знания за езика (Bulgarian ethnic dialects. Linguistic knowledge. Vol. 6. Sofia, 1986, 14-22. 39. Бояджиев, Т. Принципи и методи за класификацията на диалектите в славянските езици (Principles and methods for the classification of Slavic languages). In: Славянска филология (Slavic linguistics). Vol. 19. Sofia, 1988, 208-215. 40. Българският език и общността на неговите диалекти (Bulgarian language and its dialect community). Бълг. ез., 1983, No. 1, 7-40. 41. Клепикова, Г.П., Т.В. Попова. О значении данных лингвистической географии для решения некоторых вопросов истории болгарского языка (On the role of linguistic geographical data to resolve some issues in Bulgarian language history). Вопросы языкознания (Problems in linguistics), 1968, No. 6, 98-108. 42. Кочев, Ив. Основното диалектно деление на българския език (Major dialect boundaries of Bulgarian language). Бълг. ез., 1980, No. 4, 295-304. 43. Църнушанов, К. Българските народни говори и единството на българския език (Bulgarian national dialects and the unity of Bulgarian language). Sofia, 1968, 18 p.
44. Попова, Т. В. К вопросу о значении морфоно­логичес­ких признаков для диалект­ного членения болгарского языка (On the role of morphonological traits for the dialect differentiation of Bulgarian language). In: Общеславянский лингвистический атлас (All-Slavic linguistic atlas). Материалы и исследования (Materials and studies), 1977, Moscow, 1979, 108-124. 45. Ivanov, J. N. Zur Frage der Klassifizierung der bulgarischen Dialekte in Mazedonien. Linguistique balkanique. 1982, No 4, 43-51. 46. Pomianowska, W. Ugrupowanie gwar południowoslowiańskich w śwеtlе faktów lеksykalnych i słowotwоrzczych. Z polskich studiów sławistycznych (Warszawa), 1978, z. I, 95-100. 47. Saur, V. Jak klasifikovat bulharská nářeči? In: Sborník prací filoz. fak. Brněnské univ. Ř. Jazykovědná, 1982. roč. 31, č. 30, 155-167. 48. Vakarelski, Hr. Bemerkungen zum Verhältnis von Sprach- und Kulturgrenze auf Grund bulgarischen Materials. In: Festschrift Mathias Zender. Bonn; 1972, 99-105. 49. Христодул К. Сичан Николов. Болгарска аритметика (Bulgarian arithmetic), Букурещ (Bucharest), 1845. 50. Григорович В.И. Очерк путешествия по Европейской Турции (Travelogue of European Turkey), Казань, 1848. 51. Цонев, Б. Разпределение на българските говори според ѣ (Distribution of Bulgarian dialects according to ѣ). In: История на българския език (History of Bulgarian language). Vol. 1. Sofia, 1940, 303-334. 52. Mladenov, St. Geschichte der bulgarischen Sprache. Berlin und Leipzig, 1929, 13, 92-96, 317-318. 53. Василев, Ст. П. Граници между източните и западните български говори (Borders between eastern and western Bulgarian dialects). Родна Реч, 1934, No. 3, 179-181. 54. Георгиев, Вл. Пред­славянският произход на ятовата граница (The pre-Slavic origin of the Yat border). In: Въпроси на българската етимология (Problems in Bulgarian etymology). Sofia, 1959, 114-119. 55. Стойков, Ст. Ятовият преглас в български език (The Yat reflex in Bulgarian language). Бълг. ез., 1963, No. 4-5, 326-332. 56. Младенов, М. Сл. Ятовата граница в светлината на нови данни. (Към въпроса за диалектното разчленение на българския език.) (The Yat border in the light of new data: On the dialect differentiation of Bulgarian language). In: Славистичен сборник (Slavistic compendium). Sofia, 1973, 241-256. 57. Шаур, Вл. За произхода на ятовата граница в българския език (On the origin of the Yat border in Bulgarian language). In: Исторически развой на българския език (Historical development of Bulgarian language). Vol. 3. Сравнително езикознание. Диалектология. Превод. (Comparative linguistics, dialectology, translation), Sofia, 1983, 255-271. 58. Кочев, Ив. Фонетични и фонологични промени на ê < ѣ в говори около ятовата граница (Phonetic and phonological ê < ѣ reflexes around the Yat border. Изв. Инст. бълг. ез., 16, 1968, 437-445. 59. Генчев, Ст. Етнографски аспекти на ятовата граница (Ethnographic aspects of the Yat border). In: Първи конгрес на Бълг. историческо дружество (First congress of the Bulgarian historical society), 27-30 Jan. 1970, Vol. 2. Sofia, 1972, 145-148. 60. Генчев, Ст. Към проучването на различията между обичаите при погребение от страни на ятовата граница в Северна България (On the study of funeral rites varieties on the two sides of the Yat border). Изв. на Етнографския институт с музей, 11, 1968, 169-200. 61. Младенов, М. Сл. Ятов изоглосен пояс!? (Yat isogloss belt! ?, Съпост. езикознание (Comparative linguistics), 1990. No. 4-5, 223-227. 62. Hristova, E. 2008. The modern substitutes of the Old Bulgarian nasal vowels ѫ and ѧ in the Gorani dialect in Albania. Macedonian Review, 2:97-102 (Доц. д-р Евдокия Христова. 2008. Съвременните застъпници на старобългарските назални гласни ѫ и ѧ в горанския говор в Албания. Македонски преглед, 2:97-102). 63. Mladenov, St. Geschichte der bulgarischen Sprache. Berlin, 1929, 119-121. 64. Цонев, Б. Разпределение на българските говори tj, dj (Distribution of Bulgarian tj, dj dialects). In: История на българский език (History of Bulgarian language). Vol. 1. Sofia, 1940, 344-350. 65. Кочев, Ив. Съчетанията ш’т, жд в солунския диалект (Diphthongs ш’т, жд in Solun dialect). Бълг. ез., 1986, 5:426-428. 66. Бoжков, Р. Континуатите на праславянските съчетания tj, dj в босилиградския говор (Continua of proto-Slavic phthongs tj, dj in Bosilegrad dialect). Бълг. ез., 1987, 1-2:123-127. 67. Белић А. Галички диjалекат. Београд, 1935. 68. Селищев, А. Очерки по македонской диалектологии (Essays in Macedonian dialectology). Казань, 1918. Vol. 1. 69. Selischtscheff, A. Die slawische Bevölkerung in Albanien. Nachdruck besorgt von Reinhold Olesch. Koeln-Wien: Boehlau Verlag, 1978. 70. Selishchev, A. 1935. Macedonian dialectology and Serbian linguists. Macedonian Review (Селищев, А. 1935. Македонская диалектология и сербские лингвисты. Македонски преглед), 9(3-4), pp. 56-97. 71. Bernstein, Samuel B. A.M. Selishchev: Slavist-Balkanist (Бернштейн, С.Б. А.М. Селищев — славист-балканист, Наука, Москва, 1987). 72. Šaur, V. Bulharské št, žd < *tj, *dj. Slavia (Praha), 1985, 2:128-140. 73. Ивaнчев, Св. Развоят на *tj, *dj в шт, жд и етногенетичният процес на Балканите (Evolution of *tj, *dj into шт, жд and the ethnogenetic process in the Balkans). Старобългаристика (Old Bulgarian studies), 1981, 1:27-47. 74. Тотоманова, А. М. Още веднъж за меките к и г на мястото на праславянските tj и dj в югозападните български говори (Once again on the soft k and g at the place of the proto-Slavic tj and dj in the south-western Bulgarian dialects. Старобългаристика (Old Bulgarian studies), 1990, 3:57-59. 75. Шклифов, Б. Развойният процес на шт, жд в българския език (The process of шт, жд development in Bulgarian language). In: Първа национална младежка школа по езикознание (First national youth school in linguistics). Sofia, 1981, 24-26. 76. Георгиев, В. И. Възникване на палаталните съгласни к’ и г’ от ш’т’, ж’д’ в югозападните български говори (Development of the palatal consonants к’ and г’ from ш’т’, ж’д’ in the south-western Bulgarian dialects). — Бълг. ез., 1982, 5:398-404. 77. Видоески Б. Основни диjалектни групи во Македониjа (Major south-western Bulgarian dialect groups). Македонски jазик (Bulgarian language in Macedonia), 1960-1961, 11-12:13-31. 78. Van Wijk, N. Zur Grenze zwischen dem Ost- und Westbulgarischen. Archiv für slav. Philologie, 1925, 39(3-4):212-216. 79. Романски, Ст. Македонски преглед (Macedonian review), 1925, 5-6:169-172. 80. Цонев, Б. 1906. Добрейшово четвероевангелие. Предговор (The Dobreysha quadri-gospel. Introduction). Sofia, pp. 30-31. 81. Кочев Ив. 1959. Застъпници на меката ерова гласна в български език (Substitutes of the soft Yer vowel in Bulgarian language). In:Статьи и материалы по болгарской диалектологии (Articles and materials in Bulgarian dialectology), 9:70-82, Moscow, 1959. 82. Stefan Verković. Народне песме македонских бугара (Folk songs of Macedonian Bulgarians), Belgrade, 1860. 85. The Turks, the Greeks and the Slavons. Travels in the Slavonic Provinces of Turkey-in-Europe. By G. Muir Mackenzie and A. P. Irby, London, 1867. With Maps etc. Copyright © Lyudmil Antonov 2009. All Rights Reserved. Thank you. Labro Koroloff is a great patriot and my online friend and his page will be useful. This article is in a long need of actualisation. © 2009 Lyudmil Antonov. Powered by Blogger.